The G-Drive No. 26 of Roman Rusinov, Andrea Pizzitola and Jean-Eric Vergne, which was disqualified from the 24 Hours of Le Mans. The 2018 24 Hours of Le Mans started on June 17 and ended June 18, nearly four months ago. On Oct. 2, Le Mans organizers announced the official finishing order of the race. A drawn-out penalty appeal left a group of class winners unaware of whether they’d actually won for four months. And now we know, so that’s good. The appeal finally ended after four months, when Le Mans organizers published the final results with the No. 36 of André Negrão, Nicolas Lapierre and Pierre Thiriet on top in the second-tier Le Mans Prototype 2 class. 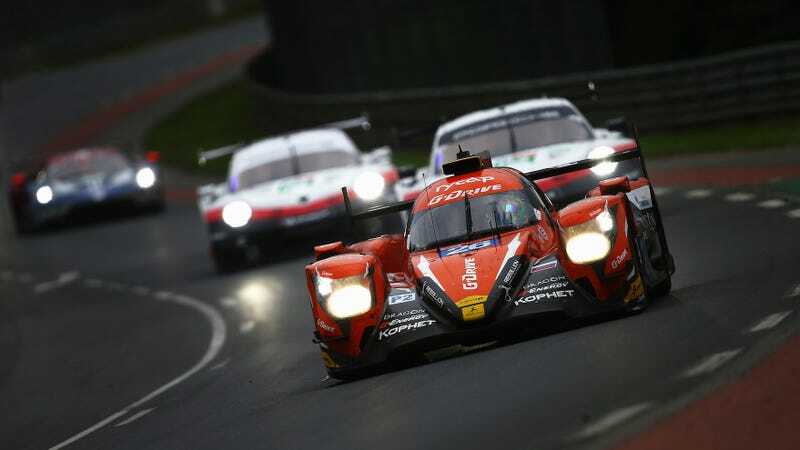 That car originally finished second in the LMP2 class in the second World Endurance Championship race of the season, two laps, or 17 miles, behind the G-Drive Racing No. 26 car of Roman Rusinov, Andrea Pizzitola and Jean-Éric Vergne. Le Mans officials disqualified the No. 26 that crossed the line first, for what they ruled to be an illegal device to speed up pit stops. The original disqualification announcement from Le Mans dinged the No. 26 team for “non-compliance of a part in the fuel restrictor,” meaning the No. 36 got the win. “Judges apparently want to take their time before reaching a verdict. My lawyer is now telling me that we may have to wait up to another week before a decision is released”. The court stated that refuelling of the two [G-Drive] TDS-run cars was approximately 25 percent faster than the other cars in class, which constituted a gain of six to 10 seconds per pitstop. TDS had modified the refuelling rigs with an additional component that fitted between the dead man cut-off valve and the flow restrictor, which limits the rate of refuelling. The French team argued that this component was a “commendable technical innovation”, according to a statement from the court, and that there was no specific regulation regarding any fittings between the fuel flow restrictor and the dead man valve.